As this year’s academic year draws to a close, now is the time to add groundbreaking experimental video art to your institution’s media collection! Save up to 20% on purchases made before June 30th, 2018 by taking advantage of VDB’s academic year-end sale. 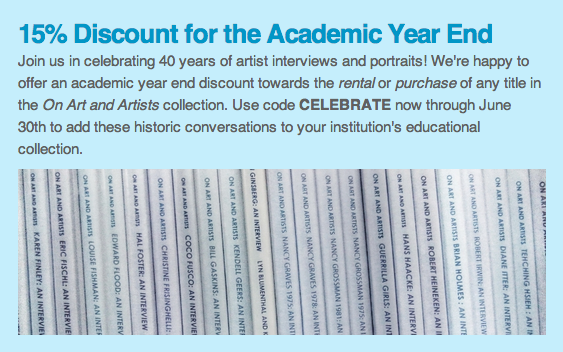 Video Data Bank’s multi-title compilations and box sets offer great value to educational institutions, allowing students, faculty, and researchers direct access to the work of moving image practitioners shaping the field of contemporary art today including A.K. Burns, Ximena Cuevas, Kevin Jerome Everson, Renée Green, Kent Lambert, Linda Montano, and Ezra Wube. The emergence of video art tools in the late 1960s and early 1970s paved the way for an extraordinary number of outstanding art works by women. Captivated by the relative accessibility, portability and immediacy of Sony’s Video Portapak recording system, a significant number of female artists began to experiment with the video format. Often taking a direct-to-camera approach, many of the resulting works reflect the burgeoning feminist movement in the U.S. at the time. Featured artists include Lynda Benglis, Hermine Freed, Suzanne Lacy, Barbara Aronofsky Latham, Susan Mogul, and Linda Montano. VDB TV: Decades is a unique series that casts a distinctive eye over the development of video as an art form from the early 1970s to the present, produced to mark the 40th anniversary of the Video Data Bank. Each program in this five-disc box set was curated by an inspiring artist, scholar, or media arts specialist focusing on a specific decade, including Robyn Farrell, Omar Kholeif, Aily Nash, Solveig Nelson, and Steve Reinke. We are delighted to spotlight Louis Hock’s The American Tapes: Tales of Immigration (2013), a four-part series that revisits the life and and times of four families last portrayed as “undocumented” immigrants in his 1986 Mexican Tapes series. Use discount code AMERICANTAPES for a 10% discount when purchased or rented with The American Tapes companion work The Mexican Tapes through May 31st, 2018. VDB TV: Decades is a unique five-disc box set that casts a distinctive eye over the development of video as an art form from the early 1970s to the present, produced during 2017 in celebration of the 40th anniversary of the Video Data Bank. Each program was curated by an inspiring artist, scholar, or media arts specialist focusing on a specific decade, diving into the archive of the VDB to create personal, distinctive, and relevant programs, accompanied by original essays and texts. VDB TV: Decades is the perfect accompaniment to VDB’s iconic anthology Surveying the First Decade: Video Art and Alternative Media in the U.S. 1968-80, providing another essential tool for understanding the development of video and media art over the past five decades. Basma Alsharif, John Baldessari, Rosa Barba, Liza Beár, Lynda Benglis, Sadie Benning, Dara Birnbaum, Paul Chan, Cecelia Condit, Ximena Cuevas, Simone Forti, Leah Gilliam, Nancy Holt, Doug Ischar, Tom Kalin, Paul Kos, Barbara Aronofsky Latham, Jesse McLean, Susan Mogul, Tony Oursler, Nicolas Provost, Walid Raad, Steve Reinke, Tom Rubnitz, Suzie Silver, Keith Sonnier, Martine Syms, William Wegman, Matt Wolf, Akram Zaatari, Julie Zando. September is finally upon us! Students and faculty are eagerly returning to colleges and universities everywhere. Save up to 20% on purchases made before October 31st, 2017 by taking advantage of VDB’s academic back to school savings. Video Data Bank’s compilations and box sets offer great value to educational institutions, allowing students, faculty, and researchers direct access to the work of moving image practitioners shaping the field of contemporary art today. This fall also sees some exciting new releases from Cecelia Condit, Frédéric Moffet, and Zhengfan Yang. VDB invites educational customers to upgrade their archives (and finally recycle the VHS players) for the new school year. Through October 2014, we are offering a 20% discount off of any title in the VDB collection previously owned on VHS. 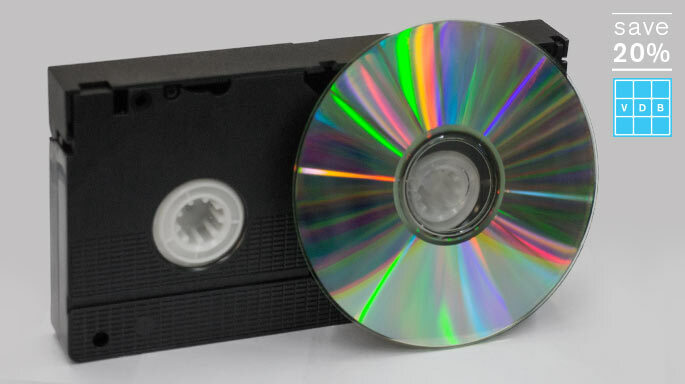 Please contact us if you are seeking to replace your classic VHS tapes with remastered DVD or BluRay, and we will confirm your past purchase and supply a discount code.